This 300 large piece jigsaw is designed by John Van Straalen and measures 51 cm diameter. A deer looks around a waterfall in the middle of the forest. Marvelous Garden is a 300 piece round jigsaw puzzle designed by artist Oleg Gavrilov. Stately peacocks stand on a Mediterranean balcony in their colourful plumage. Pink peonies and roses fill the waterfront view. Available in two-piece counts. This 300 large piece jigsaw is designed by Rosiland Soloman and measures 51cm in diameter. This round puzzle contains 1000 piece and measure 67cm in diameter. Available in two piece counts. Each of our delightfully illustrated jigsaws is available in both 300 large pieces and 1000 standard pieces for puzzlers of all abilities. Watchful Eyes by Gary Lessord measures 50 cm. This puzzle puts the viewer under the watchful eyes of a tiger and her cubs. Available in two-piece counts. 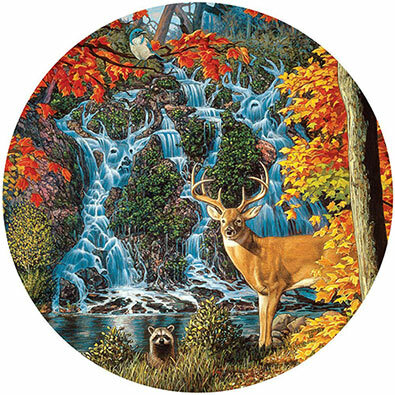 This 500 piece jigsaw is designed by John Van Straalen and measures 51cm diameter. Available in two piece counts. This round puzzle contains 300 large piece and measure 51 cm in diameter. This puzzle depicts a few women sitting in a beautiful garden of oriental origins. Resting By Fire by Debbie Cook. Each of our delightfully illustrated jigsaws is available in both 300 large pieces and 1000 standard pieces for puzzlers of all abilities. This item measures 67cm diameter. Resting By The Fire by Debbie Cook. Each of our delightfully illustrated jigsaws is available in both 300 large pieces and 1000 standard pieces for puzzlers of all abilities. This item measures 51cm diameter.